Mariculture is the farming of aquatic plants and animals in salt water. Thus, mariculture represents a subset of the larger field of aquaculture, which involves the farming of both fresh-water and marine organisms. The major categories of mariculture species are seaweeds, mollusks, crustaceans, and finfish. Recent information indicates that the total amount of seafood (including fresh-water species and aquatic plants) is about 140 million metric tons annually. Over 20 percent of the total comes from aquatic plants (mostly seaweeds). Marine fish account for only 2 percent of the total. Mollusks (clams, oysters, abalone, scallops, and mussels) represent the most important species cultured in marine waters. Seaweeds (brown, red, and green) are a close second. While most people do not think that they eat much (or any) seaweed, extracts from seaweeds can be found in everything from toothpaste and ice cream to automobile tires. Seaweeds themselves are dried and used directly as human food in many parts of the world. Crustaceans include shrimp, crabs, lobsters, and crayfish. While shrimp culture has become a major industry in Asia and Latin American since the early 1980s, global production is far less than that of mollusks and seaweeds. Marine fish production is even smaller. Top finfish groups include Atlantic salmon, milkfish, sea bream, sea bass, red drum, yellowtail, striped bass, and hybrid striped bass. 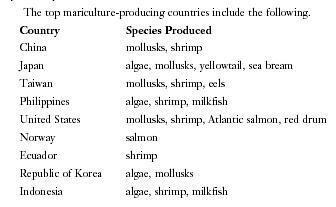 The top mariculture-producing countries include the following. Various levels of technology are involved in mariculture, the lowest giving nature the major role in producing the crop. The culturist may help prepare the growing area but does little else. For example, oyster culturists may place old shells on the bottom to provide places for a new generation of oysters to attach. The oysters feed on wild phytoplankton and are harvested when they reach the proper size. The next level would be to spawn oysters in a hatchery and allow the larval oysters (called spat) to settle on oyster shell, after which the shell is placed on the oyster bed in bays or suspended on ropes from a raft. Mussels and scallops also can be grown on ropes below rafts. The culture of blue mussels on long ropes is common in the bays and inlets of Nova Scotia, Canada. This mollusk is economically important to local growers, even though it represents only a small fraction of the province's mollusk production. Shrimp and various species of marine fishes are often grown in ponds. The young shrimp and fish are usually produced in hatcheries, though collection of young animals from nature has been used in the past and is still used in some cases. The ponds may be filled with sea water by pumping water, or through tidal flow (the farmer opens the floodgate when the tide is rising and closes it when the pond is full). Depending on the particular species being produced and the size at stocking, the time required for the animals to reach market size can range from a few months to nearly 2 years. In addition to ponds, marine fish also are being reared in floating pens or cages in protected bays. * Most cultured salmon are produced in these types of facilities, primarily in Norway, Canada, the United States, Scotland, and Chile. Various other fish species also are being produced in pens and cages in Japan, Europe, and the Middle East. In recent years, there has been interest and a limited amount of activity associated with cage culture in offshore waters. The highest level of technology is associated with indoor facilities in which the animals are grown in raceways or tanks (circular raceways) that receive pumped seawater that may be taken directly from the ocean. The water may be flowed through the tanks and discarded, or it may be recirculated, that is, reused by passing it through an elaborate water treatment system. Marine species can be reared to market size in such facilities, but they are most commonly used as hatcheries and to hold broodstock (adults used for reproduction). Low-technology forms of mariculture take advantage of the nutrients and other physical and chemical characteristics of the ocean. 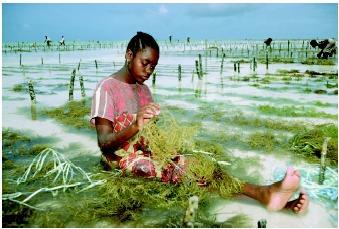 This employee works with cultured seaweed on an East Africa plantation. The cycle of planting and harvesting occurs every 3 to 4 weeks year-round, and daily hours are spent preparing, planting, and collecting the seaweed during low tide. control under culture conditions or are very complex. In addition, a number of popular food animals are highly cannibalistic. Various species of crabs and lobsters, for example, are difficult-to-rear species that also are cannibalistic. Opposition to mariculture has developed in several countries since the 1980s. Many people do not want to see pens and cages in their bays, and they are concerned about possible environmental impacts associated with mariculture. Scientists are attempting to address these and a variety of other issues that have been raised. The goal is to produce high-quality seafood in an environmentally responsible manner. Although world fish production from capture fisheries leveled off during the 1990s, demand for seafood continues to increase. This is because of the growth of the human population and also the view that seafood is healthy food. Scientists believe that natural production from the ocean will not increase; consequently, if the demand for seafood by humans is to be met in the future, both mariculture and fresh-water aquaculture production will have to increase significantly. SEE ALSO Aquaculture ; Bivalves ; Crustaceans ; Fish ; Fisheries, Marine ; Food from the Sea . Avault, James W., Jr. 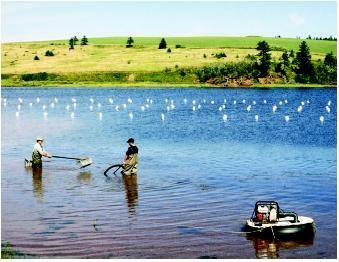 Fundamentals of Aquaculture. Baton Rouge, LA: AVA Publishing, 1996. Stickney, Robert R. Principles of Aquaculture. New York: John Wiley & Sons, 1994. * See "Aquaculture" for a photograph of a floating net pen. The information is very important and the pictures are also interseting. I was glad to find it, essential infos needed to my frame work was found here. amaizing how poor is internet considering the subject of mariculture (in my native webs just few words from encyclopedia). Honestly recomand this article.